The finished doll measures 11 inches tall, but you can reduce or enlarge to suit your needs. 1 piece card stock 5" x 4"
Rubber stamps, inks, stickers, etc. (to make a tu tu! ), etc. Either print or trace the template page onto card stock. If you print directly onto card stock, you will be able to use the head with a face on it and the printed "corset." Cut out all pieces. If you printed your doll onto card stock, be careful to cut INSIDE the lines (so you don't end up with the outlines on your doll). Decorate parts as desired (you can wait to do this until assembled, if you prefer). Attach appendages to the torso with brads (the torso goes on top). The arms may go either way, depending on the look you want. 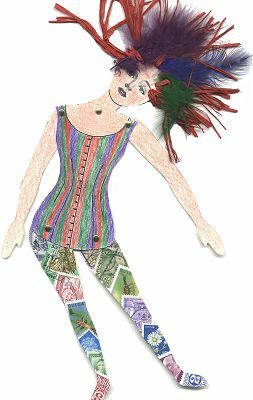 Add embellishments such as hair (this is your chance to use all of the neat fibers that are available! ), jewelry, clothing, a hat, etc. To add hair, simply punch holes around the top of the head and tie fibers through. Attach the body parts with ribbon or fiber. If you do this, you might prefer to use eyelets to reinforce the holes. Make a doll with shrink plastic -- this makes a great pin! I find it easier to use a small drill to make holes after the shrinking is done. Use wire or jump rings to attach the appendages.